Dragon from a chu-tanzaku set of twelve prints Buyu mitate junishi, “Chosen Heroes for the Twelve Signs.” Based on the Chinese zodiac system of twelve animals. 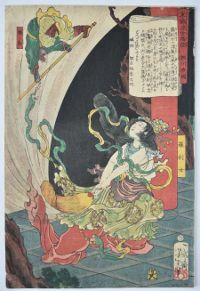 Shows Susa-no-o-no-Mikoto standing on a rock and observing a dragon under the waves. (Probably the eight-headed dragon he slew in Idzumo.) 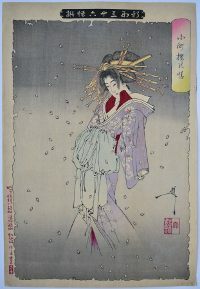 Published by Minatoya Kohei, c. 1840. 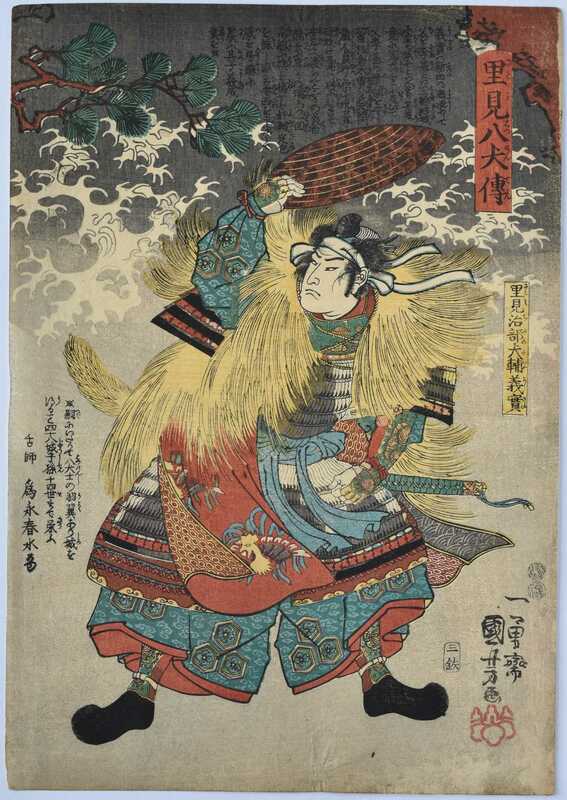 Tiger from a chu-tanzaku set of twelve prints Buyu mitate junishi, “Chosen Heroes for the Twelve Signs.” Based on the Chinese zodiac system of twelve animals. 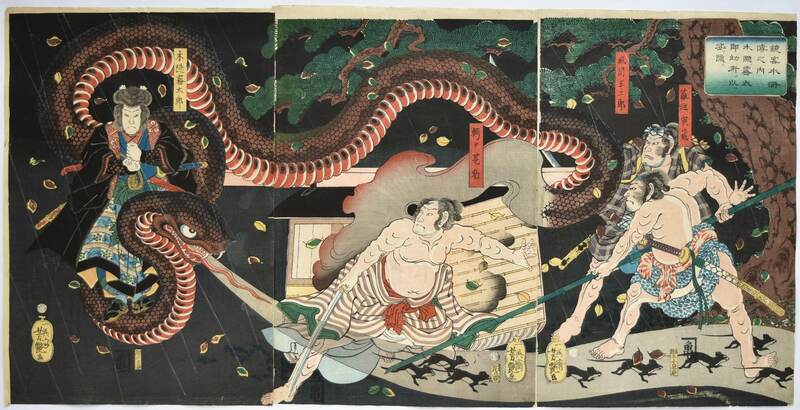 Shows Kashiwade no Omi Hatebe (sic, usually Hadesu) engaging with a tiger that had killed his daughter. 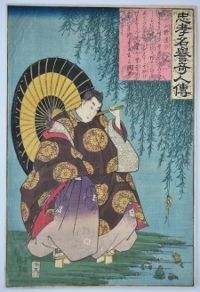 Published by Minatoya Kohei, c. 1840. 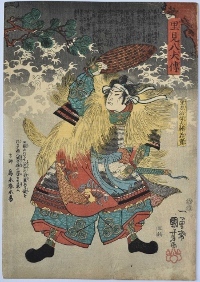 Hare from a chu-tanzaku set of twelve prints Buyu mitate junishi, “Chosen Heroes for the Twelve Signs.” Based on the Chinese zodiac system of twelve animals. Shows Iga Jutaro, the elderly retainer of Soma Yoshikado, sacrificing a hare in a Buddhist temple. Published by Minatoya Kohei, c. 1840. 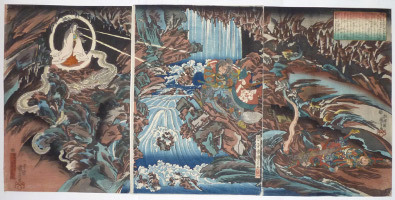 A triptych, Ujigawa Kajiwara Kagesue, Sasaki Takatsuna, miju uma. Yoshitsune is informed that Kiso no Yoshinaka is entrenched behind the natural defence of the Uji river, then in full flood. 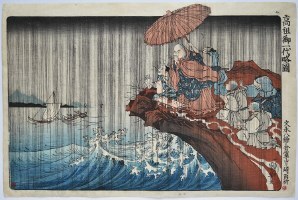 Yoshitsune calls on Kajiwara Kagesue and Sayemon-no-jo Sasaki Shiro Takatsuna to make an attempt at fording the river. 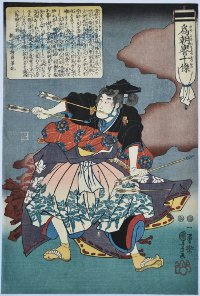 He gives them his best horses: Surusumi to Kagesue and Iketsuki to Takatsuna. They plunge into the river with Takatsuna, dodging the hail of arrows, arriving first. One of Kiyochika’s best designs. Published 1899. Fine impression and colour. Album backing and slight vertical fold on centre panel. Signed Kiyochika. Monkey from a chu-tanzaku set of twelve prints Buyu mitate junishi, “Chosen Heroes for the Twelve Signs.” Based on the Chinese zodiac system of twelve animals. Shows the Monkey King, Songoku (Sun Wu K’ung) conjuring up an army of monkeys to attack his enemy the pig. 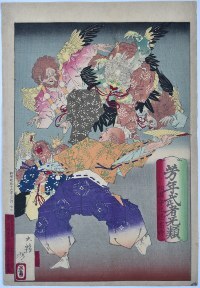 Published by Minatoya Kohei, c. 1840. Ox from a chu-tanzaku set of twelve prints Buyu mitate junishi, “Chosen Heroes for the Twelve Signs.” Based on the Chinese zodiac system of twelve animals. 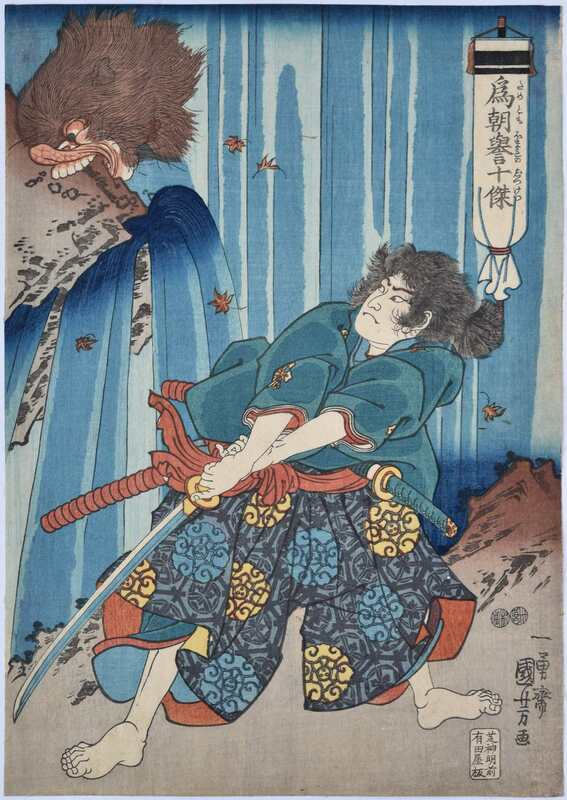 Shows the robber Kidomaru under a buffalo hide looking at his reflection in water while attempting to ambush and kill Raiko. Published by Minatoya Kohei, c. 1840. Horse from a chu-tanzaku set of twelve prints Buyu mitate junishi, “Chosen Heroes for the Twelve Signs.” Based on the Chinese zodiac system of twelve animals. 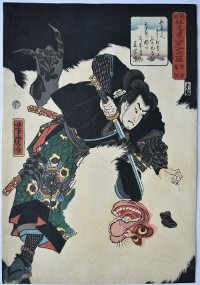 Shows Soga Goro (Tokimune) galloping from Hakone to Mount Fuji to meet his brother Juro and fulfill their revenge in the course of Yoritomo’s great hunting party in 1193. 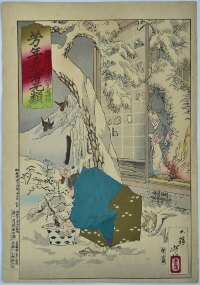 Published by Minatoya Kohei, c. 1840. Goat from a chu-tanzaku set of twelve prints Buyu mitate junishi, “Chosen Heroes for the Twelve Signs.” Based on the Chinese zodiac system of twelve animals. Shows the Chinese hero Kwanu (Kuan Yu) seated drinking under a pine tree with a goat. 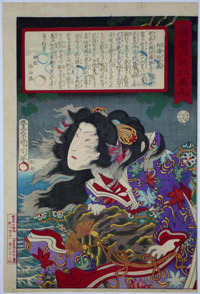 Published by Minatoya Kohei, c. 1840. Rat from a chu-tanzaku set of twelve prints Buyu mitate junishi, “Chosen Heroes for the Twelve Signs.” Based on the Chinese zodiac system of twelve animals. 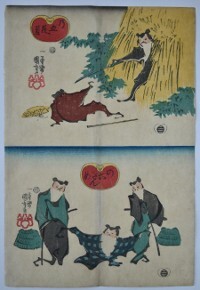 Shows Raigo Ajari at the Onjoji monastery, Miidera, turning the Buddhist scriptures into rats. Oye no Masafusa looks on in dismay. Published by Minatoya Kohei, c. 1840. 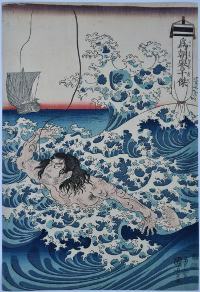 Shows Tametomo’s faithful retainer Kiheiji who is left behind by mistake when Tametomo sails for Japan from the Ryukyu Islands. 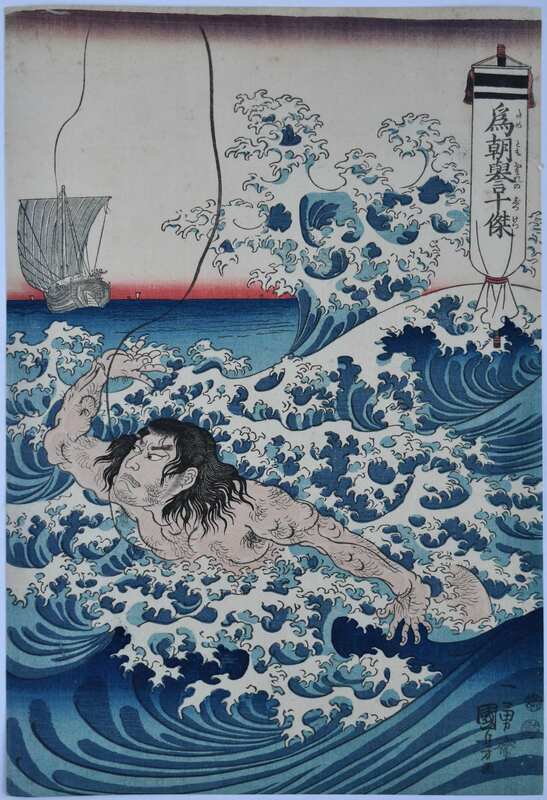 He throws a weighted rope the immense distance to the ship and is hauled in. 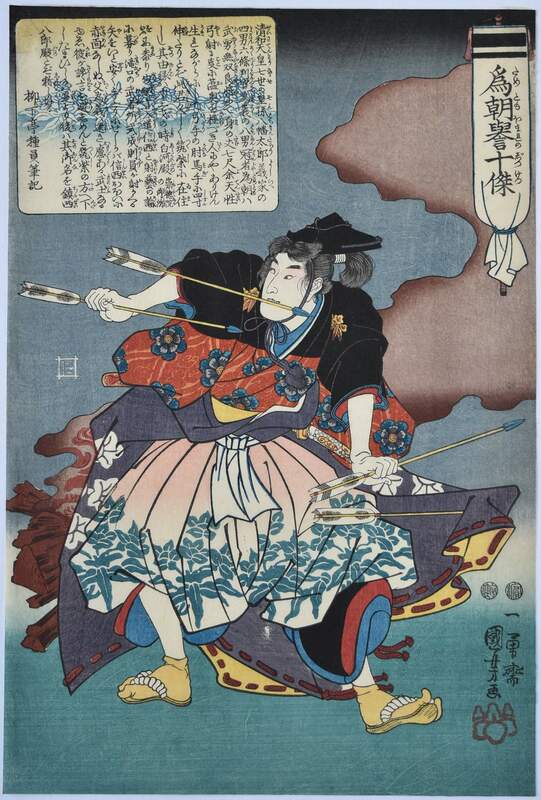 The best design from Tametomo homare no jikketsu, “Ten Famous Excellences of Tametomo.” A set of ten prints published by Aritaya Seiyemon, c. 1848-51. Fine impression and colour. Slight trimming, otherwise very good condition. 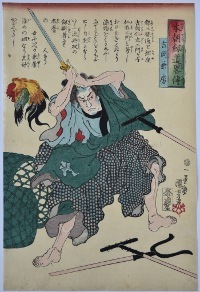 Signed Ichiyusai Kuniyoshi ga.
Tominomori Sukeemon Masakata, one of the famed Forty-seven Ronin, sword drawn, during the famous night attack on the house of Kono Moronao. The hanging bell, above, was an early intruder alarm system. (Interestingly, it’s also said that squeaks were deliberately incorporated into wooden floors for the same reason.) 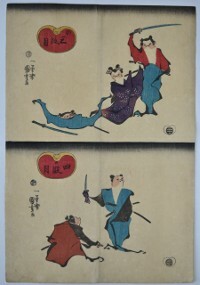 This unusual western-style set is also rare in having the printer’s name, Ohisa Daiihitsu, on five (including this) of the twelve prints in the set. Published by Sumiyoshiya Masagoro, 1852. Fine impression and colour. Slight trimming, otherwise very good condition. 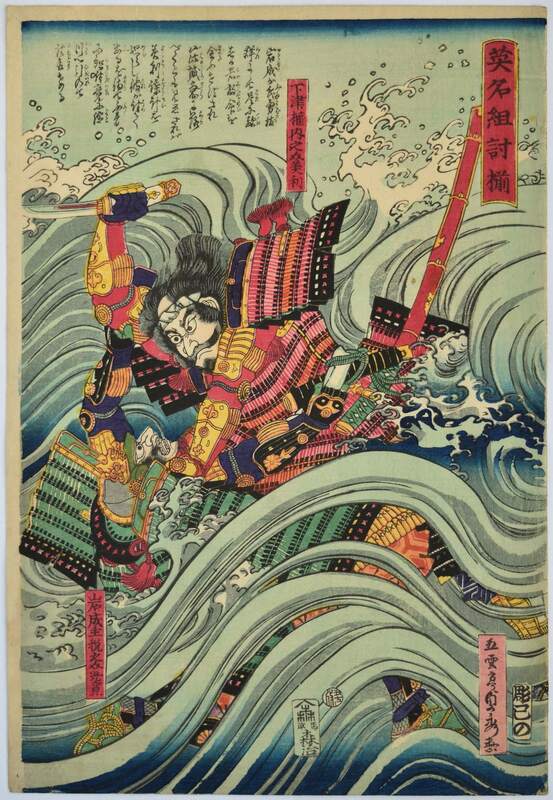 Signed Kuniyoshi ga.
Iwanari Chikara no Suke and Shimozu Gonnai struggling in the water from Eimei kumiuchi soroi, “A Series of Famous Fighting Warriors.” Published by Moriya Jihei, 1865. Fine impression, colour and condition. Signed Gountei Sadahide ga.
Ono no Tofu (Michikaze) in court robes learns perserverance by watching the efforts of a frog to climb a branch of a willow tree. From a set Chuko meiyo kijin den, “Stories of Remarkable Persons of Loyalty and High Reputation.” Published c. 1845 by Enshuya Matabei. Robinson S35.10. 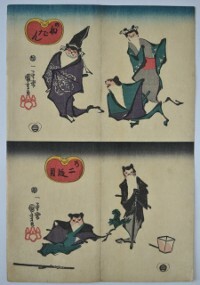 Six uncut double chuban sheets from a bat Chushingura set. Acts 1 to 6: Shodanme; Nidanme; Sandanme; Yodanme; Godanme; Rokudanme. 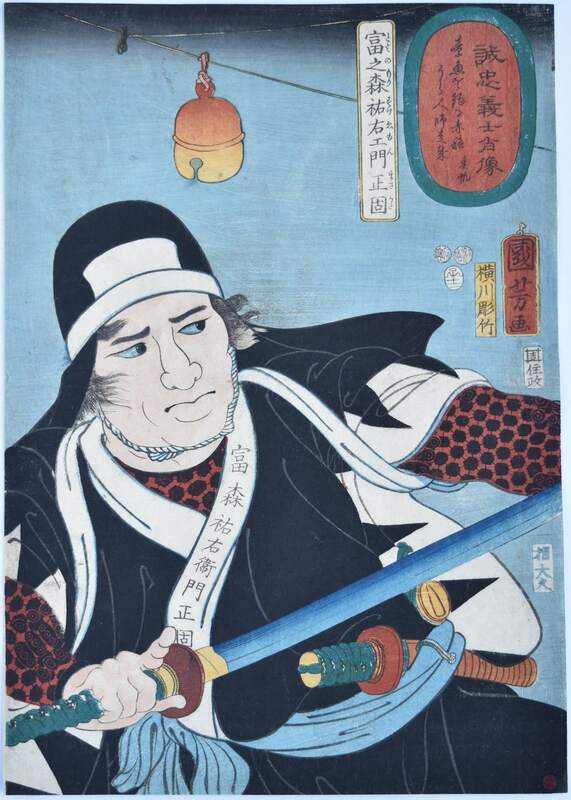 Published c. 1847 by Ibaya Senzaburo. Of the utmost rarity: I cannot, at the moment, locate other examples from this set. Fine impressions and colour. Vertical centre folds, otherwise fine condition. Signed Ichiyusai Kuniyoshi ga on each sheet. 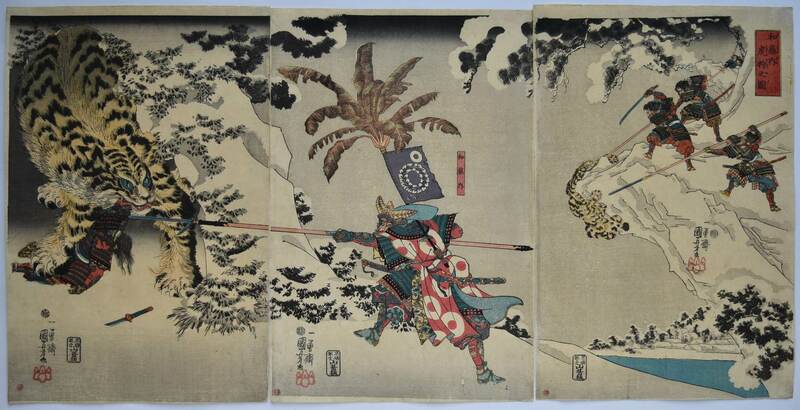 A triptych Masakiyo sankan taiji no zu, “A Picture of Masakiyo Conquering Korea.” The design purports to show Kato Kiyomasa (1562-1611) invading Korea, but is probably a reference to the English bombardment of Kagoshima harbour in 1863. There is further confusion by the Koreans being dressed in medieval European costumes. Published by Yamaguchiya in 1864. 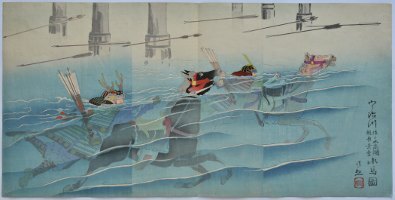 There is a history in ukiyo-e of commenting on current – but sensitive – events, but setting them in the distant past to avoid censorship. Fine early impression with burnishing on boat. Fine colour. Slight creases along right edge of sheets, otherwise very good condition. Signed Ikkaisai Yoshitoshi ga.
A triptych showing the famous battle at Honno-ji Temple, Nakagyo-ku, Kyoto in 1582. Honno-ji dai gassen no zu. 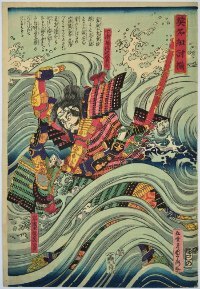 The Daimyo Oda Nobunaga was at the height of his powers but came under attack from his treacherous samurai general Akechi Mitsuhide and the Oda forces. 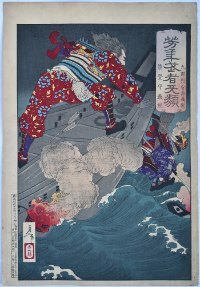 Nobunaga, his wife Noh and his retainers battle valiantly but he is forced to commit suicide. Published by Fujiokaya Keijiro, 1861. Very fine impression, colour and condition. 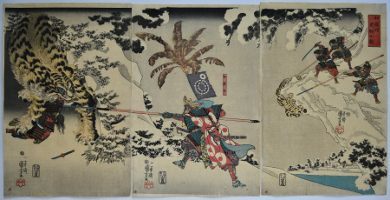 Signed Ikkesisai Yoshichika ga.
A triptych showing Kato Kiyomasa (Watonai) attacking a huge man-eating tiger in a snowy Korean landscape. 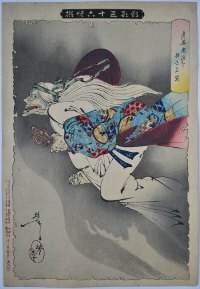 Watonai tora-gari no zu. His henchmen tackle other tigers. This is one of his best known exploits in Korea, there being two expeditions in 1592 and 1597. 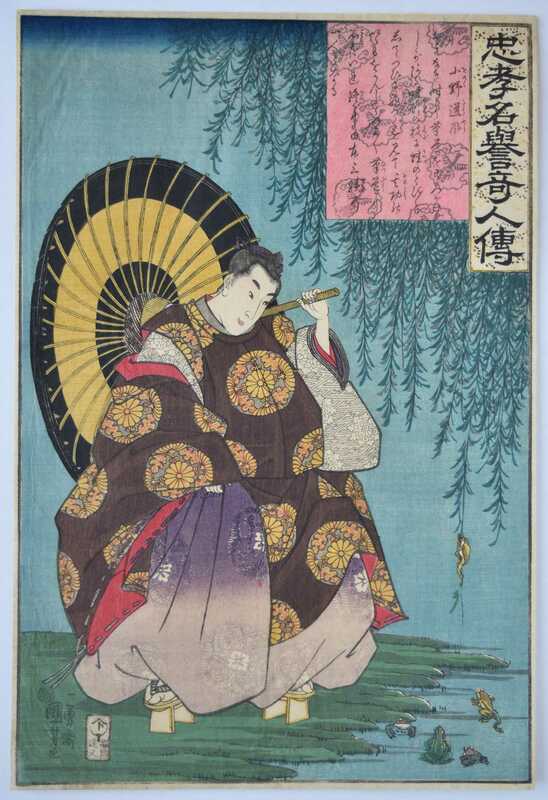 Published by Yamashiroya Jimbei, c 1846. Robinson T183. A fine and rare design. Fine impression, colour and condition. Full size. 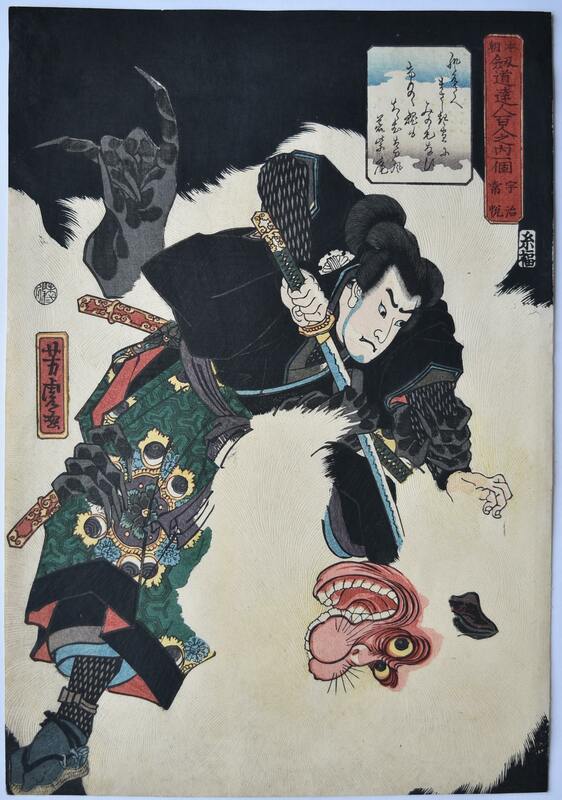 Signed Ichiyusai Kuniyoshi ga.
Uji Joetsu killing a huge monster with a long-haired albino coat and giant claws. 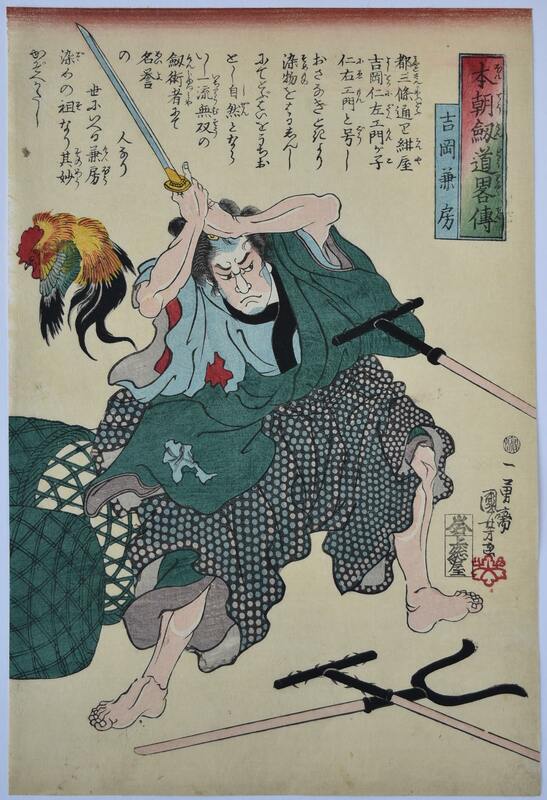 From a set: Honcho kendo tatsujin hyakunin no uchi hitori, “A Hundred Great Swordsmen of Our Country.” Published by Itoya Fukujiro, 1859. Fine impression. The monster’s coat completely blind-printed. Fine colour. Slightly trimmed, otherwise very good condition. Signed Yoshitora ga. The priest Nichiren standing on the rocky promontory at Reizan in Kamakura and having his prayers for rain answered. The event occurred in 1271. His disciples surround him and protect him from the deluge with a large umbrella. Bunei hachi Kamakura Reizan-ga-saki uki. The second best design from Koso [ Nichiren ] goichidai ryakuzu, “Illustrated Abridged Biography of the Founder.” Nichiren ( 1222 – 1282 ) was the founder of the Buddhist Nichiren sect ( Nichiren shu – Kuniyoshi being a follower ) and indeed the set of ten prints may have been commissioned to mark the 550th anniversary of his death. Published by Iseya Rihei c 1831. Fine impression and colour. Small repaired binding holes in right margin, otherwise fine condition. Full size with ample room on top border for the umbrella which protrudes beyond the border and is notorious for being trimmed. 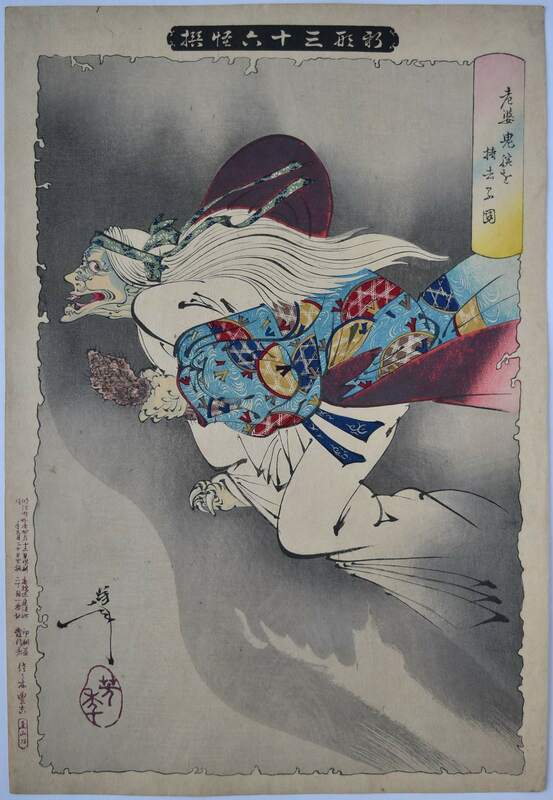 Signed Ichiyusai Kuniyoshi ga.
Hashihime from Buyu nazoraye Genji, “Heroic Comparisons for the Chapters of Genji.” Shows Watanabe no Tsuna on horseback and the demon-woman Ibaraki at the Modori bridge, Ichijo, Kyoto. An o-tanzaku set published by Iba-ya Sensaburo, c 1843. The fifty-four Chapters of Genji, the Genji Monogatari, was a tenth century romance by Murasaki-Shikibu. In this version of the story Watanabe is enchanted by a beautiful young woman, but his suspicions are aroused and then confirmed when he sees her reflection in the river which reveals her true demonic self. The outcome of this version is the same with Ibaraki’s arm being cut off. A dramatic triptych: Kyokyaku Suikoden no uchi: Kogakure no Kiritaro yojutsu o motte sugata o kakasu. The Kyokyaku Suikoden: Kogakure no Kiritaro hiding himself by using witchcraft. 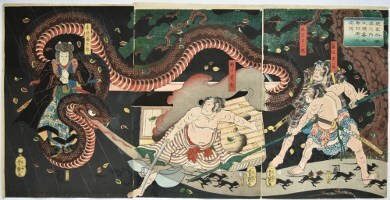 The snake, with Kiritaro standing on him, has emanated from the kago in the centre sheet to the confusion of the three attackers: Waniguchi Jinsuke (centre) and Masakino Torazo and Kazama Hanjiro. A stream of rats is emitted from the snake’s mouth. I have not been able to source this story. Published by Kameya Iwakuchi, 1861. Rare. Fine impression. Very good colour. Sumi marks au verso showing through slightly, otherwise very good condition. 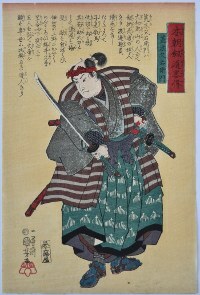 Signed Ichieisai Yoshitsuya ga.
Tametomo at the age of thirteen catching the arrows shot at him by two of the Emperor’s guard in a competition with Shonagon Nyudo Shinsei. From a set: Tametomo homare no jikketsu, “Ten Famous Excellencies of Tametomo.” The set published by Aritaya Seiyemon, c 1848-51. Extremely fine impression, colour and condition. 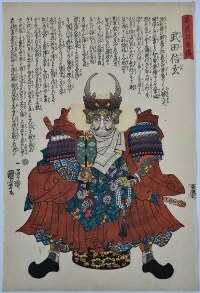 Signed Ichiyusai Kuniyoshi ga.
Takeda Shingen seated and holding a war-fan and rosary and fully armoured. From a series: Meiko hyaku yu den, “Stories of a Hundred Heroes of High Renown” published by Idzumiya Ichibei, 1843-4. Very fine impression, fine colour and condition. Signed Ichiyusai Kuniyoshi ga.
Minamoto Tametomo (1139-70) decapitating Yamaotoko from a set of ten prints: Tametomo homare no jikketsu, “Ten Famous Glories of Tametomo.” A great archer (it being said that his left arm was four inches longer than his right), and a wild and colourful character. 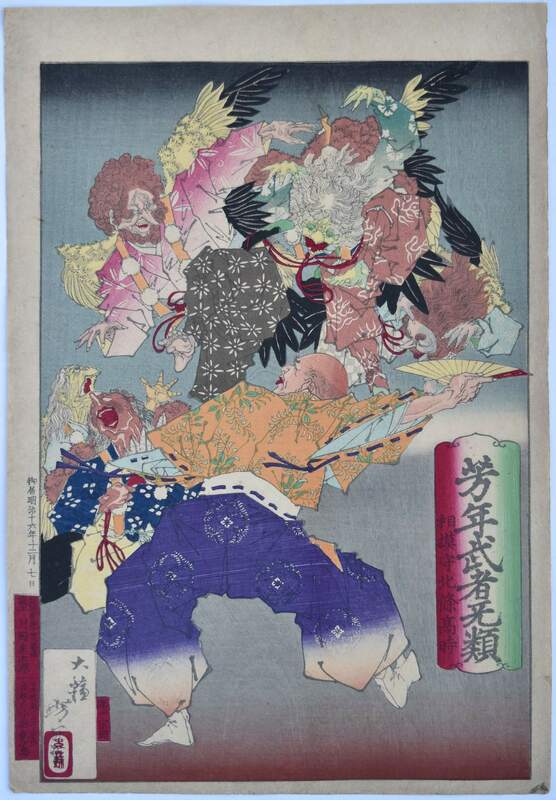 The story shown here relates how Tametomo, while exiled to the island of Izu Oshima, discovers a nearby island inhabited by creatures with a demon-like countenance, red faces and long red hair hanging over their foreheads. He eventually subjugates the devils and is regarded as a king by the islanders. 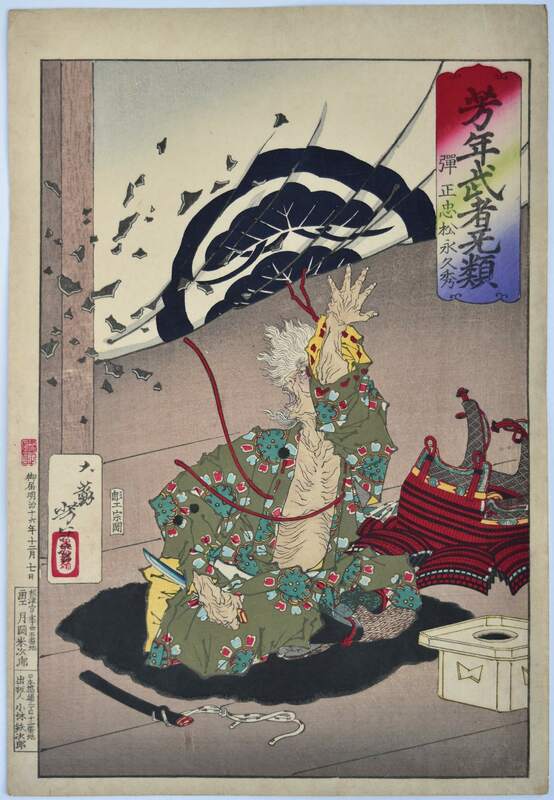 Published by Aritaya Seiemon, 1847-50. 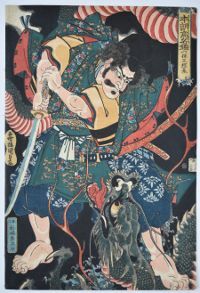 Satomi Jibu-no-taifu Yoshizane, a daimyo in control of Takita Castle from Satomi Hakkenden, the eight heroes of Bakin’s novel Hakkenden. 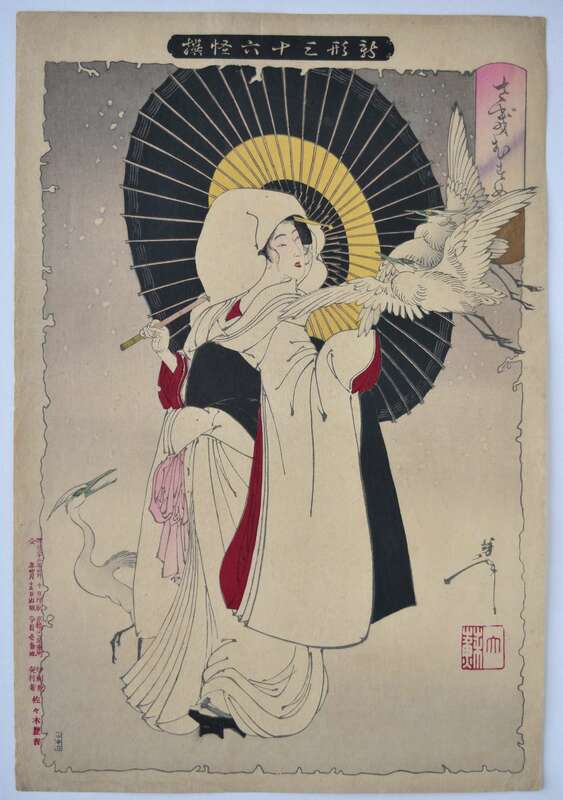 Published by Mikawa-ya Tetsugoro, c 1849-51. See the Kunichika triptych of the same subject on this current selection. Very good impression, colour and condition. 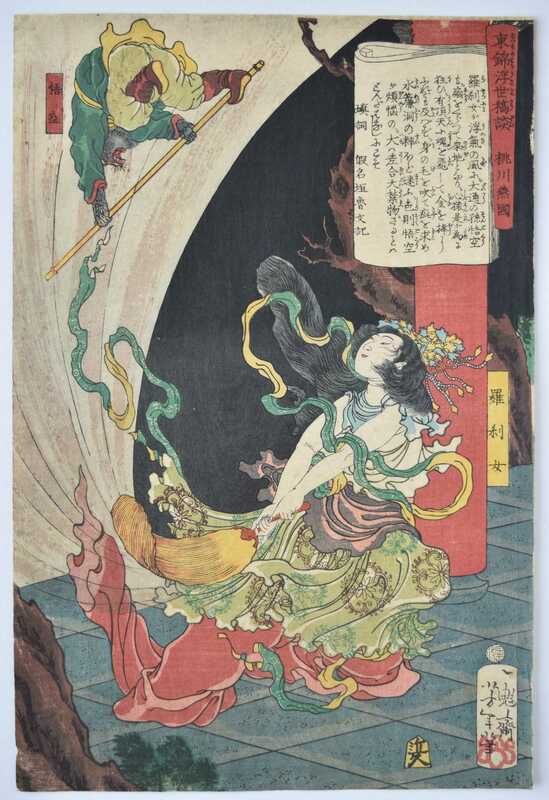 Signed Ichiryusai Kuniyoshi ga.
Nitta Tadatsune encountering the goddess of Mount Fuji and her dragon in a cavern with numerous stalactites and a fast flowing river and waterfall. She complimented Tadatsune on his courage while his compatriots were stricken with terror. Statues of the goddess Kwannon ( Chin: Guanyin ) are often found in caves. Published by Tsuji-ya Yasubei, c. 1844. Robinson T143. A fine design. Araki Matayemon standing, examining his sword from Honcho kendo ryaku den, “Abridged Stories of Our Country’s Swordsmanship.” The set published by Kadzusaya Iwazo in c 1845-6. 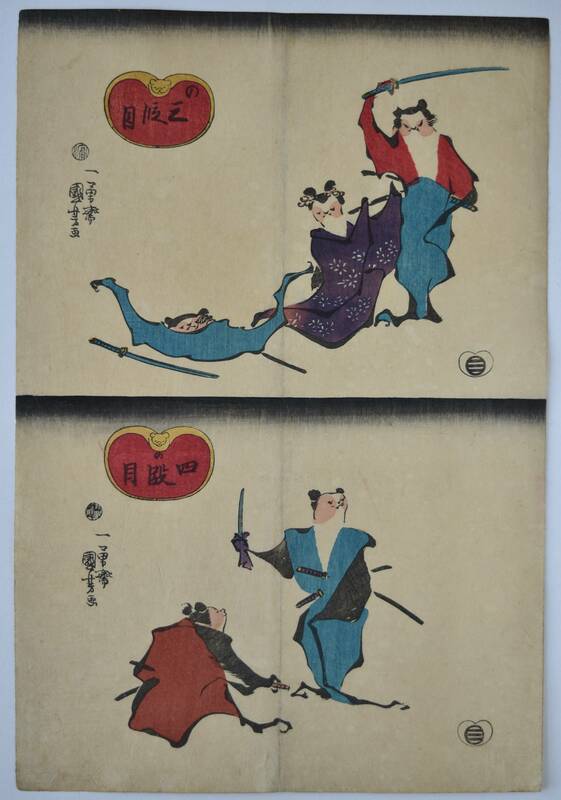 Yoshioka Kanefusa defending himself in an attack by police from Honcho kendo ryaku den, “Abridged Stories of Our Country’s Swordsmanship.” The set published by Kadzusaya Iwazo in c 1845-6.